Arachne, the daughter of the dyer, Idmon, who learned fromGoddess Minerva art of weaving and embroidery, has surpassed her mentor mastery. Gods do not tolerate, when mortals surpass them in something and punish people. Minerva turned Arachne into a spider, and since then a beautiful embroiderer weaves a web. But the art of creating beautiful things, decorated with exquisite embroidered motifs, became available to people. The art of embroidery on fabric, leather and feltKnown for a long time. For a long time the masters have developed a lot of techniques, techniques and drawings. One of their types is lace embroidery. The technique is to create a pattern with through holes. Glazy cutlery technique. In the glazier technique, the contour of the pattern is free,curvilinear. Embroidery in this technique can be made on the fabric not only of linen, but also twill or satin weave, as well as nonwovens: knitwear, felt, felt, leather. The figure, executed by a smooth surface, is supplemented with cut out parts, through, or filled with a grid. An example of a countable technique is the well-knownCross-stitch embroidery. 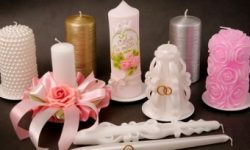 If you pull out a part of the yarns of the fabric, then by the formed drawn sections you can embroider, forming a pattern of various threads of warp threads in a certain rhythm. One of the oldest types of sewing "Along the ridge" Is a hem. To create a pattern of the hemming, only weft yarns are pulled on the canvas. A more complex kind of openwork calculating technique bearsThe name of a string or stitch embroidery. To create it in a certain order, both the warp threads and the weft threads are pulled out. The remaining threads of the fabric are wrapped, forming a grid. Embroidery is made on the resulting grid. 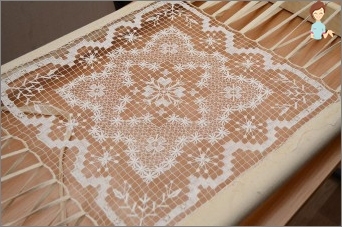 In Europe, one of the techniques of counting openwork sewing along the drawn strands is the hardanger. The embroidery style is named after the Norwegian fjord. This is a traditional technique for Scandinavian countries, used to decorate clothes and household items. The source of this style is Persia. In Europe the hardanger became known from the 17th century. Russian centers of sewing wereNorthern provinces. In different localities, embroiderers worked out their patterns and methods of filling the net with a pattern. 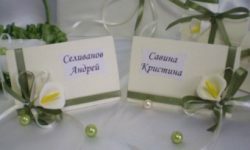 So, they distinguish the Yaroslavl, Vednov, cross equipment. It uses a thicker cloth,Vydergom formed a large mesh - up to 5 cm for the style of the cross is characterized by patterns in the form of stars, snowflakes. The main difference between the stitch and the cross is the presence of tricks - the new stitches, which complement the mesh base with straight and diagonal lines. The new stitches of the cross stitch, made on the large cells of the net, are called guipure. There is another kind of needlework, reminiscent of a cross-stitch along the grid - a needle lace. The Italian reticha is made on a grid and knocks, created by pulling the warp threads. 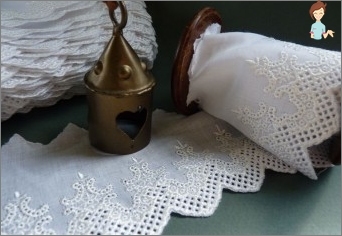 The technique of a needle lace hedebo, common in Sweden and Denmark, reminds a hardanger, but the work is performed not by the threads left behind when the thread is pulled, but by the motives stretched inside. Therefore, the composition is composed not only of geometric shapes located parallel to the web threads, but can have a complex curved shape. Sewing on the grid is also called a filigree embroidery. The technique of loin embroidery can be imitated by crocheting. A hook hooked from thin threads, for example, reel, a loin of napkin can hardly differ from embroidered. Products Vednovskih masters are very thin andOpenwork. Sewing is performed on a thin linen cloth or batistu with the formation of grid cells of less than 4 mm. For a small Tver stitch, the methods of filling the grid cells are typical "Darning" with "linen cloth". "Flooring", And other types of stitches. 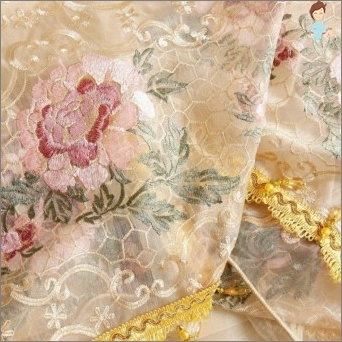 There is an openwork machine embroidery in the line technique. 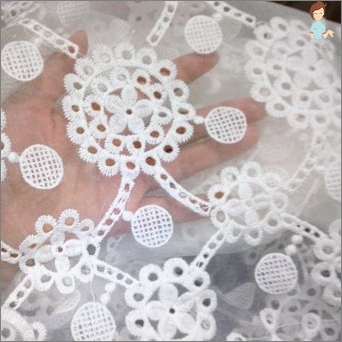 It is an industrial manufacture of lace, tulle. Embroidery with slotted smoothness can be performed in the technique of English sewing or Richelieu. Richelieu and English sewing remind Venetian needle lace. Most often the work is done with white threads on a white napkin. But it is possible to use colored threads or fabrics. Openwork embroidery, where for contour processingThey use stitches, called richelieu. It is said that Cardinal Richelieu was very fond of products with such embroidery, and he was a very skilled embroiderer in this technique, that's why they called her. Probably, this fact is not historical, because the openwork sewing in this manner existed before - it originated in the XIV century. The contours of the pattern are pretreated with stitching stitches Forward the needle For amplification. Usually 2-3 rows of seams are laid close to each other. Then, the stitches are laid over the top. The parts of the pattern that should be through are carefully cut out. If the area of ​​the cut out element is significant, then it is filled with bridges. 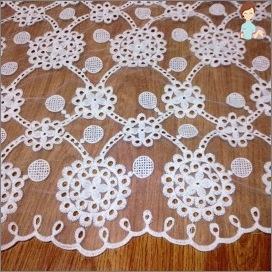 Openwork embroidery Richelieu used to decorate clothes, table and bed linen. There is another kind of openwork embroidery, similar to the Richelieu, as it is called - English sewing. But the elements are embroidered with a smooth roller withFlooring. The flooring is done with small stitches. The larger the embroidered element is needed, the thicker the threads for the flooring are used. The stitches are executed perpendicular to the seams of the flooring. The large cut out parts of the pattern are also filled with bridges, but they are thinner than in the Richelieu, because they are not made with stitches but with a thread. For greater elegance of the pattern on the lintels, "Peak" and Spiders. Another difference from the Richelieu - the stitches of the smooth surface can be located at an angle to the contour of the pattern and have different lengths, enhancing the decorative effect. In the works executed in the Richelieu technique, allThe stitches are the same size. Therefore, openwork embroidery with an outlined contour of the picture can be performed not only manually, but also on an ordinary sewing machine with a line "zigzag". 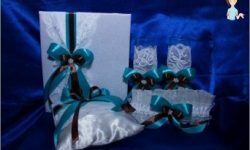 All kinds of openwork embroidery look good on napkins, tablecloths, and other products. Clothing adorned with skilled sewing will always be one of the fashion trends. Of course, now the art of decorating fabrics with graceful drawings made with the help of threads and needles has largely been lost. But lovers of this kind of needlework, too, create objects of decorative and applied art, worthy of former master-embroiderers.